Since 2010, CARAS has quickly risen to become Australia’s Leading Remediation Project Management Consultancy. CARAS quantifies and puts an accurate dollar value on the groundwork risk of complex construction projects. They then deliver expert, client-side project management to improve efficiency, reduce waste and further control cost and risk. How is CARAS using Dashpivot? Auditing is an inherently documentation heavy endeavour. There's no point in walking around site and capturing what's going on and what's right and wrong without documenting it properly. The importance of documentation and organisation to CARAS prompted an interest in finding a more streamlined solution for their auditing and documentation needs. Part of that mindset and effort centred on the way that they actually captured data and information from the field, while part of it was the way that they reconciled and organised that data once it was captured and stored. Audits have long been captured through a combination of paper and clipboards, word docs, excel spreadsheets and standalone apps. But this is a) inefficient and b) results in non-standardised information being captured and stored. This isn't ideal for data reconciliation nor for auditing compliance and regulation. Dashpivot enables CARAS auditors and employees to walk around site with a tablet or mobile and fill in digital forms (when online or offline) - such as pre-starts, meeting minutes and photo reports. CARAS is a company which prides itself on accurately assessing costs, risks, and procurement solutions, so the data they capture is paramount to the advice they give and the informed decisions they make. Outside of the actual capturing of information, CARAS is also able to keep their digital records more organised with Dashpivot - which is extremely important for a company who operates and performs well in the compliance and legal realms. 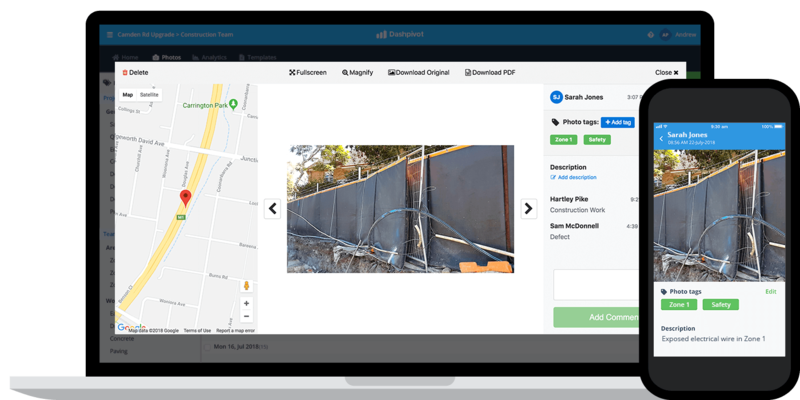 Every form, photo, video and piece of evidence captured with Dashpivot is automatically pushed into the relevant projects and teams. The way that Dashpivot is structured and architectured meant that CARAS could setup a number of projects, which have a number of teams within them e.g an audit team and a site team and then a number of users associated with that team or project. This means that people don't have to spend their time uploading, downloading and sending their forms, documents and photos to the right places - because all of their work is automatically pushed to the right place as it happens. Every form or photo the audit team on project A create, open or complete is automatically stored in the project A audit teams workspace - in real-time. It also means that they don't forget to send things or keep them stashed on their own hard-drives. Dashpivot also gives CARAS greater control over how they search for and find the information they have created and completed. Instead of hunting through folder structures not designed for site or project use, CARAS management and individuals can search for work via tags, comments, dates and the person who conducted that work. Outside of that, software has many other perks over and above traditional document types, which add some shine and important evidence to CARAS's records e.g photos are stored with comments and tags, as well as GPS location. CARAS has also been able to benefit from automating some of its previous manual workflows, improving collaboration and optimising and the speed at which work moves through the company. Workflows are a document 'type' in Dashpivot. Some forms created and completed on site are simple standalone forms which need to be completed and stored as records, such as diaries and dockets. Other forms need to be signed off by multiple parties or approved before work can go ahead - such as permits and reports. For these types of forms, CARAS has been able to create their own custom workflows. When a CARAS employee creates an incident report or permit, it 'enters' the workflow. It sits at the beginning of the workflow until is is completed and signed. 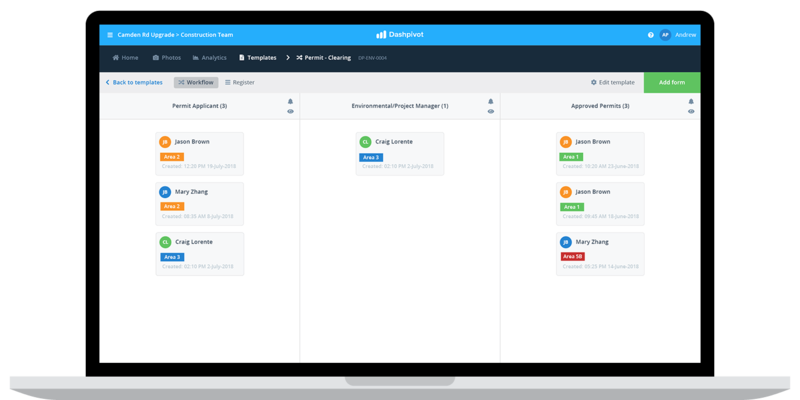 Once signed, the workflows automatically moves to the next 'column' where the next responsible person receives a notification that it requires their attention. 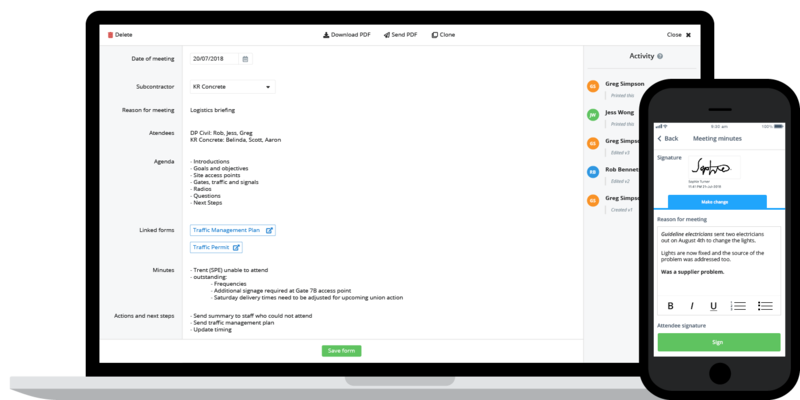 These workflows remove the need for emailing documents back and forth, and mitigate the chance that anything important gets missed. And if it does get missed, CARAS knows who's column it is sitting in! CARAS is even using this feature to automate some of their timesheets. An employee 'creates' their timesheet, fills it in on their laptop or mobile device, and then signs it off. The finished timesheet, once signed, is then automatically sent for review, with the reviewer receiving a notification that the timesheet is sitting in their column ready for approval. All of these workflows, as well as the notifications are customised by CARAS to suit their teams and individuals. What has Dashpivot done for CARAS? As Australia's leading remediation project management consultancy, CARAS is a highly trusted and relied upon project party. With Dashpivot, CARAS saw an opportunity to build upon this trust and immaculate record by improving upon their already stellar processes. Dashpivot has fit right into the client and process-centric way that CARAS likes to work. By improving the way that data is captured on site and better organising these documents, photos and records, CARAS is able to spend less time doing admin and moving work around, and more time working with clients and achieving better results for all parties.